Vedantu.com - No.1 online tutoring company in India provides you the Free PDF download of NCERT Solutions for Class 6 Science Chapter 13 - Fun with Magnets solved by Expert Teachers as per NCERT (CBSE) Book guidelines. 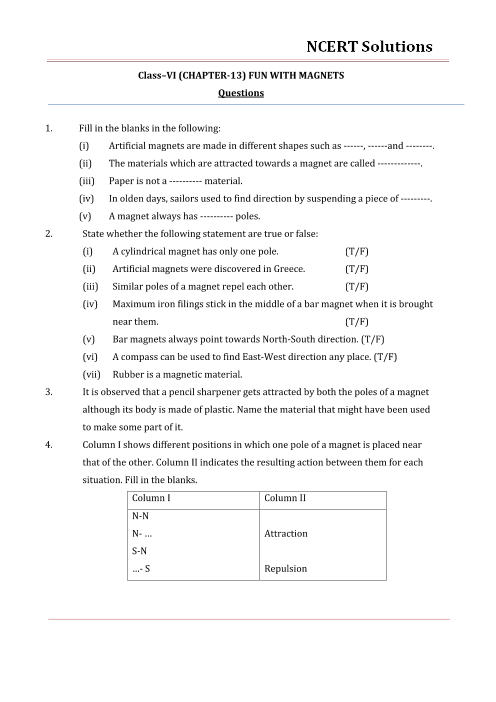 All Chapter 13 - Fun with Magnets Exercise Questions with Solutions to help you to revise complete Syllabus and Score More marks. Register for our free webinar class with best Science tutor in India. NCERT Grade 6 Science Chapter 13, Fun with Magnets discusses about the discovery of magnets, magnetic and non-magnetic materials, properties of magnets and applications of magnets. The chapter begins with the wonderful story of the discovery of magnets. The chapter further discusses about magnetic and non-magnetic materials. This section deals with definition, examples and identification of materials and helps the students to classify magnetic and non-magnetic materials with the help of activities and simple explanation for better understanding. The next section, Poles of Magnet, clears the concept of the poles of the magnet. This section will help the students to understand that every magnet has two poles i.e. north and south. Further, use of the poles of the magnet to determine directions and study magnetic properties is further learnt through this chapter.A section on how to make your own magnets is also a part of NCERT Grade 6 Science Chapter 13, Fun with Magnets. Basic and simple laws of magnetism that include attraction and repulsion are included towards the end of the chapter. Technical terms and summarising points given at the end of the chapter help to learn the concepts at a glance. Get 100 percent accurate NCERT Solutions for Class 6 Science Chapter 13 (Fun with Magnets) explained by expert Science teachers. We provide solutions for the questions given in Class 6 Science textbook as per CBSE Board guidelines from the latest NCERT book for Class 6 Science. The topics and sub-topics in Chapter 13 Fun with Magnets are given below. Ex 13.5 - ATTRACTION AND REPULSION BETWEEN MAGNETS. Chapter 13 - 10 Questions with Solutions. Other than given exercises, you should also practice all the solved examples given in the book to clear your concepts on Fun with Magnets. Download the free PDF of Chapter 13 Fun with Magnets and take the print out to keep it handy for your exam preparation.